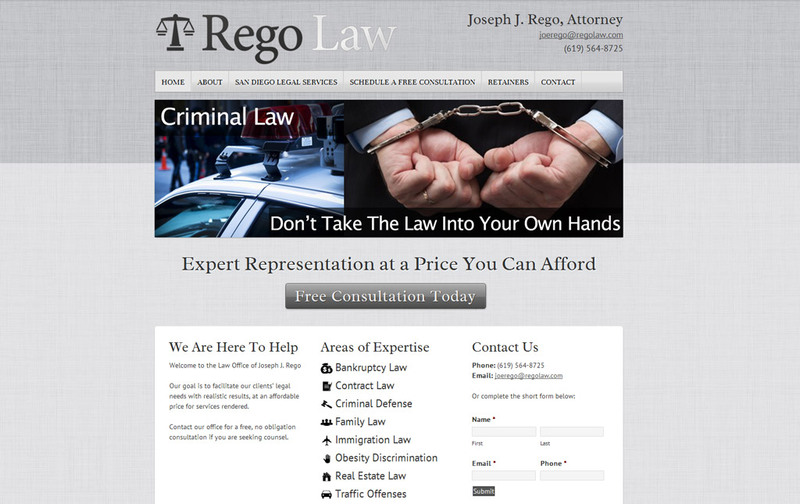 Rego Law is the San Diego, CA law office of Joseph Rego, providing representation in the practice areas of: Bankruptcy Law, Criminal Defense, Immigration Issues, Family Law and Real Estate Law in the San Diego area and beyond. Their goal is to facilitate their clients’ legal needs with realistic results, at an affordable price for services rendered. 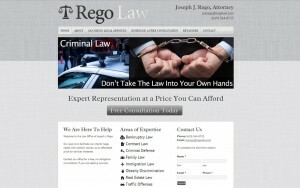 Rego Law approached Design SEO Hosting with an existing website that they needed re-designed. Additionally, they wanted to update and audit the content on their existing site – so we worked closely with them to determine the content structure for the new website. Rego Law also wanted a website they would be able to manage in-house, utilizing a content management system to enable easy updating. We designed a basic site for Rego Law using a minimal, simple palate. The site serves as an informational resource on how they can provide assistance in their selected areas of expertise. Visitors to the site have the ability to contact Rego Law directly from each page, and they are also able to schedule a free consultation via a short form.